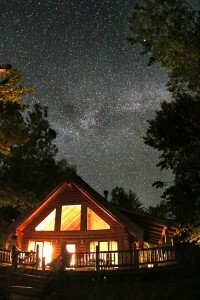 This is Creekside cabin at Elbow Lake Lodge, in Cook, Minnesota. It’s gorgeous and it could be your family’s next unforgettable vacation. Nestled between the Boundary Waters Canoe Area and Voyageurs National Park, Elbow Lake Lodge boasts a 600 foot natural sand beach, surrounded by pristine water and wilderness. * indicates required Email Address * First Name Last Name Twitter id Twitter Handle What are you interested in? Creekside was built for my late grandmother, Marjorie, who always wanted a log cabin on a beach next to a creek. Needless to say, she found the perfect spot at Elbow Lake Lodge. Built for grandma, not a single detail was missed in the construction or layout of this beautiful log cabin. The cabin is privately owned but is part of Elbow Lake Lodge. Meaning it is stocked with my families kitchenware, appliances, grills, and bedding. These are generally much nicer than what is available at other units at the lodge. 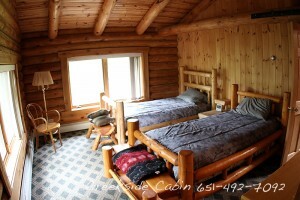 Plus, when you stay there, you get access to all of Elbow Lake Lodge’s common areas. The Beach at Creekside cabin, Elbow Lake Lodge. 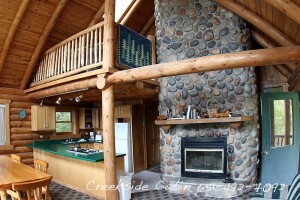 One of the biggest draws to Creekside cabin is the beach. It has walk on access from the deck to the beach. But the most spectacular part of the beach is that it is 100% natural. It maintains a very shallow depth until about the end of the lodge’s main dock. At which point, it drops to about 15 feet and then drops again to 40. From family time in the water to the swimming raft and fishing, the beach is a fabulous place for families and guests. 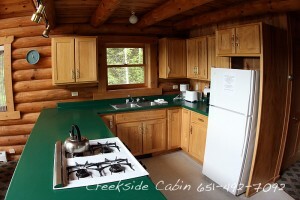 The kitchen at Creekside cabin is ready for you when you arrive. It has a full kitchen including a oven, range, dishwasher, double sink, toaster, coffee maker, fridge, freezer, and a great view of the lake. It is easy to cook for your family and watch them on the beach at the same time. The marina at Elbow Lake Lodge is on the far end of the property from Creekside. It is an easy walk to get to and provides a great separation from swimmers on the beach and boaters and fisherman. You can rent a fishing boat or pontoon boat from Elbow Lake Lodge at 800-441-1620. One of my kids’ favorite things to do is go explore the point and lighthouse in the marina. Make sure to show your kids this neat little path. If you are a fisherman, there is an aptly named “fish surgery” building where you can practice being a fish surgeon while being screened in away from any bugs. Fish Surgery also has stainless steel tables and a sink for cleaning. Every night, the sun sets across the lake from Creekside. When the weather cooperates, you end each day with a natural show. The living room has a dining table for six, two rockers, and a couch with a table for comfortable time together. The vaulted ceiling accentuates the large logs and stone fireplace. Tucked under the loft, is a full kitchen. Large windows provide easy viewing of beautiful Elbow Lake. The spacious wrap-around deck provides serious relaxation. Enjoy it during the day while you are working on your tan, or stargaze at night. The side portion of the the deck has an overhang created by the cabins roof. It’s perfect for those times when you just need a little shade or to get out of the rain. The side deck overlooks a small pond and meadow while the front faces the natural beach and lake. Tucked behind the fireplace and kitchen on the main floor you will find the lower bedroom and bath. The lower bedroom has a queen sized bed and comes with clean bedding. The room has two large folding closets, a dresser, and windows on two walls for great light. The bathroom has a mirror, makeup table, toilet, shower, and jacuzzi bath. The upper bedroom is directly above the lower bedroom. It has two twin beds with footstools, a dresser, mirror, closet, and adjacent bathroom. The upper bathroom has a sink, toilet, shower, and jacuzzi bath tub.